Diabetes mellitus is a very common problem worldwide. Everybody knows someone who has diabetes. In America alone, 8% of the population or 17 million people have diabetes. The scary thing is that the number of people with diabetes is increasing, with up to 2 million new cases being diagnosed every year. More importantly, diabetes is the third leading cause of death in the United States after heart disease and cancer. Diabetes mellitus is a metabolic disorder, whereby either the body does not produce enough insulin or the insulin that is being produced does not work properly. This affects the way that glucose, sugar and carbohydrates are metabolized in the body. Diabetes is a condition that can affect both children and adults. It is a chronic medical condition that lasts a lifetime and cannot be completely cured. 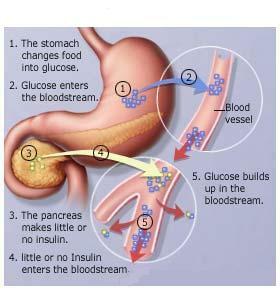 Insulin is a hormone that is produced by the pancreas. Insulin regulates the way your body uses the glucose, sugars and carbohydrates that you eat. Insulin therefore plays an important role in controlling your blood glucose levels. When your blood glucose level rises, such as after eating a hearty meal), insulin is released from the pancreas to lower and normalize the glucose level in the blood. Having diabetes means that your body is unable to process the sugars and carbohydrates, and so you will have high blood glucose levels (hyperglycemia). Type 1 (insulin dependent) diabetes mellitus: In type 1 diabetes, the body is unable to produce insulin for the metabolism of the carbohydrates. This is because the pancreas is mistakenly recognized as "foreign" and becomes under attack by antibodies from the immune system (autoimmune attack). Why this happens is still unclear, although there may be a genetic link. This type of diabetes commonly occurs before the age of 30. If you have type 1 diabetes, you will need to have regular insulin medication which is given as an injection. Type 1 diabetes accounts for 10% of all cases of diabetes. Type 2 (non-insulin dependent) diabetes mellitus: In type 2 diabetes, the body is still able to produce insulin, but the insulin is either insufficient for use or defective. In addition, the cells in the body (especially the muscle and fat cells) become less sensitive to insulin and do not make proper use of the insulin produced. This type of diabetes commonly occurs after the age of 40. Initially, this can be treated with diet, exercise and oral glucose-lowering tablets. However, some will ultimately require insulin injections. The major risk factors for developing type 2 diabetes are obesity, poor eating habits and lack of exercise. Type 2 diabetes accounts for 90% of all cases of diabetes. Gestational diabetes mellitus: This type of diabetes sometimes arises during the second or third trimester of pregnancy due to hormone imbalances during pregnancy. For most women, this diabetes is temporary and goes away after the baby is born. However, up to 50% of women with gestational diabetes may eventually develop type 2 diabetes later on in life. The risk is greater in women who require insulin treatment during pregnancy and remain overweight after childbirth. If you have gestational diabetes, you will be asked to undergo a glucose tolerance test 6 weeks after delivery. HOW IS DIABETES MELLITUS DIAGNOSED AND MONITORED? The most accurate way of diagnosing diabetes mellitus is with the fasting blood glucose test. You will need to have fasted overnight for at least 8 hours before a sample of blood is taken and sent for analysis. The normal fasting blood glucose levels should be less than 100 mg/dL. To be diagnosed with diabetes, your fasting blood glucose must be more than 126 mg/dL on at least 2 separate occasions. The oral glucose tolerance test is the one way of diagnosing type 2 diabetes and gestational diabetes mellitus. You will need to be fasted overnight for at least 8 hours (but not for more than 16 hours) before a fasting blood glucose sample is taken. After that, you will be given 75 grams of glucose (100 grams for pregnant women) to drink. Your blood sample will be taken at 1 and 2 hours after drinking the glucose. Gestational diabetes is diagnosed when the fasting glucose is more than 95 mg/dl), the 1-hour glucose level is more than 180 mg/dl, and the 2-hour glucose level is more than 155 mg/dl. Home fingerprick testing is done by pricking your fingertip with a needle and placing the drop of blood onto a glucose meter to obtain a reading. Testing should be done before and after mealtimes. Many meters are available, and which meter to use depends on your preferences: amount of blood needed, speed of analysis, screen size, etc. The results help determine how well your diabetes is controlled. Hemoglobin A1c is a measure of the control of the sugar level for the 3 months prior to testing. In diabetics, the ideal level is less than 7.0%. There is a 10 to 20% reduction in risk of vascular disease with every 1% reduction in hemoglobin A1c. WHAT ACUTE PROBLEMS CAN YOU GET FROM DIABETES? Diabetes mellitus causes both acute and chronic problems. 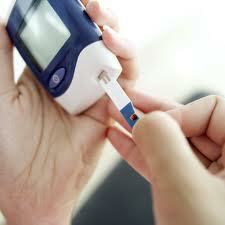 Acute problems occur when the blood glucose level becomes too high or too low. All cases of acute diabetes complications are life-threatening medical emergencies that require immediate treatment. Diabetic ketoacidosis occurs in type 1 diabetics, where an excessively high blood glucose causes dehydration (due to excesive loss of fluids in the urine) and acidosis of the blood (due to the release of ketones into the bloodstream). Symptoms of diabetic ketoacidosis include nausea, vomiting and abdominal pain. This should be treated promptly with insulin, antibiotics and intravenous fluid replacement. Hyperosmolar coma occurs in the elderly with type 2 diabetes, where there is dehydration and increased blood osmolality but no acidosis of the blood. It has a higher death rate compared to diabetic ketoacidosis. This should be treated promptly with insulin and intravenous fluid replacement. Hypoglycemia occurs when the blood glucose level is too low (less than 65 mg/dl). A low blood sugar reduces the ability of the brain cells to work. Symptoms include dizziness, confusion, weakness and tremors. If untreated, it can cause coma, seizures and irreversible brain death. This may occur when the blood glucose level is less than 40 mg/dl. WHAT CHRONIC PROBLEMS CAN YOU GET FROM DIABETES? Diabetes mellitus affects the entire body, and not just one specific organ or limb. Chronic, long term complications from diabetes mellitus are due to the way the the blood vessels in the body are exposed to high glucose levels over the long term. Both large and small blood vessels are affected. The higher the blood sugar level and the longer the exposure, the greater the risk of cardiovascular problems. In large vessel (macrovascular) disease, the walls of the large blood vessel become hardened and narrowed due to accumulation of glucose and fat deposits. This causes a lack of blood supply to vital organs such as the heart (ischemic heart disease / angina / heart attack), brain (stroke), and limbs (claudication). In small vessel (microvascular) disease, the small blood vessels also become obstructed, thereby depriving smaller tissues and organs of blood. This affects the kidneys (diabetic nephropathy) and nerves (peripheral neuropathy). If not managed properly, these can cause kidney failure requiring dialysis and gangrene requiring amputation. Diabetes mellitus also affects the eye, and is the leading cause of new cases of blindness among adults aged from 20 to 74 years. 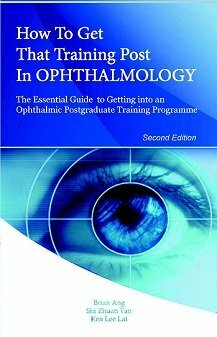 Visual impairment from diabetes can occur from cataract, glaucoma, diabetic retinopathy and vascular events to the retina or optic nerve. HOW CAN COMPLICATIONS OF DIABETES MELLITUS BE REDUCED? Tight blood glucose control with insulin is the most important factor in preventing diabetes-related complications. Two major international clinical trials, the Diabetes Control and Complications Trial (DCCT) and the United Kingdom Prospective Diabetes Study (UKPDS), have conclusively proven that intensive control of blood glucose levels decreases the vascular complications from diabetes mellitus. However, such intensive control is also associated with increased risk of hypoglycemia. Hence, more frequent self fingerprick testing is required daily. Aim for a hemoglobin A1c level below 7%. The optimal level is less than 6.5%. Aggressive control of the blood glucose level can be achieved with insulin injections 3 times daily. There are 2 types of insulin: long-acting and short-acting insulin. Usually a combination of insulin types is used. The dose and proportion of each type depends on your blood glucose control based on the home fingerprick testing and hemoglobin A1c levels. Good blood pressure control has also been shown to be beneficial in reducing microvascular complications, especially diabetic nephropathy. Your heart has to work harder when blood pressure is high, and your risk for diabetes problems goes up. Unfortunately, high blood pressure is a problem that won't go away without treatment. The commonest medications for high blood pressure are angiotensin converting enzyme inhibitors, angiotensin receptor blockers and beta blockers. If you have diabetes mellitus, your ideal blood pressure level should be below 130/80 mmHg, as recommended by the American Diabetes Association and the National Institute of Health. If you have high cholesterol, your risk of cardiovascular problems increases. Good cholesterol control can be achieved through lifestyle measures as well as through medication. Aim for a triglyceride level of less than 150 mg/dL, a low density lipoprotein (LDL) cholesterol level of less than 100 mg/dL, and a high density lipoprotein (HDL) cholesterol level of more than 60 mg/dL. Lifestyle factors are also important in reducing the risk of diabetes-related complications. Maintaining a healthy diabetic diet, keeping fit and giving up smoking are all part of good diabetes control. Try to do about 30 minutes of aerobic exercise, such as brisk walking, most days of the week. If you're just starting out, start with less strenuous exercise for around 10 minutes. As your fitness improves, you can gradually increase the time and exertion level of your exercises. Smoking increases your blood pressure and raises your blood sugar level which makes it harder to control your diabetes. Even if you are unable to stop completely, you can reduce your risk just by cutting down on the number you smoke a day. A diabetes diet aims to help control your blood glucose levels through the proportional grouping of foods. This is because your glucose level will differ throughout the day: it will be higher after meals and lower in between. 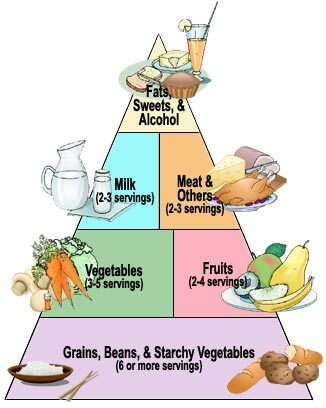 Maintaining good glucose control depends on coordinating what you eat (based on the food pyramid above) and when you eat, testing your blood sugars regularly and taking your medications as instructed. To ensure that you receive adequate fiber intake, use the 5/5 rule: foods must have less than 5 g of sugar and more than 5 g of fiber.